By R. Van Bergen. One of the first European-originated histories of Japan to appear in the English language, this remarkable work revealed many of the Asian nation’s ancient secrets to the world—many of which have once again been lost in the mists of time and political correctness. The author tells the story of Japan from its earliest recorded time, but focuses in particular on its relations with the outside world and the effects of its interactions with European nations in particular. – That the almost overnight transformation of Japanese society from an antiquated rural society into an industrial giant was achieved by copying European technology. – The dramatic story of how superior European warfare technology eventually broke the Japanese isolation and their subsequent embracing of that technology. 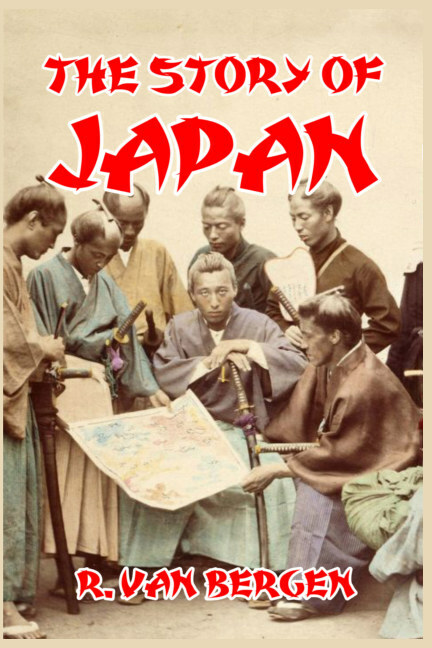 A fascinating account of Japanese history written from a European perspective. About the author: Robert Van Bergen M.A. was one of the first Americans to enter Japan after that nation ended its centuries of isolation following the famous Admiral Perry incident, and won renown in the Asiatic nation for teaching English to its nobility, becoming Principal of the Nobles’ School in Tokyo. While there, he wrote the first comprehensive histories of Japan to appear in English, and acquired considerable additional fame in the West as a result.